GoIndoor offers real time indoor navigation tools and technologies which are as easy to use as GPS is for outdoors. We help you locate and guide your visitors inside a building through their mobile devices. We offer technology which is very useful and easy to implement. The need for indoor Locationing arises since GPS doesn’t work inside the buildings. It may be difficult for visitors to reach a specific location without being delayed especially if it’s a new and big place. Whether it’s a hospital, railway station, an office campus or a big shopping complex, GoIndoor technology can help you guide your visitors to navigate through the place without any hassles. Bluetooth Low Energy signals from devices known as beacons are the base of our technology. These beacons are inexpensive, small and have a long battery life. And, Bluetooth technology is being supported by all the devices these days. Signals received from the beacons are then processed by our SDK to compute precise location of the device. This location information can then be used in different applications in many different ways. GoIndoor's Admin Panel is a web based service which offers tools needed for the initial set up for your Indoor positioning project. It helps you manage your locations, create navigation routes, set up Points Of Interest (POIs), create notifications and define default properties for places, edges and notifications. This data is available to the applications through the GoIndoor library. Any changes made to any of the objects is instantly available to the applications through GoIndoor SDK. The important change with this version is with respect to the UI of the application. It has been designed to make it more responsive and user friendly. The Admin Panel functionalities discussed in the following sections are also exposed through a REST interface for use by third party applications. Refer this section for more details. To be able to access the Admin Panel, you need to register for a new account here. After the account is successfully created, log in to the account and create a workspace account. Use the workspace credentials to login to the Admin Panel. 3. The home page of the Admin Panel is as shown below. The first step of the setup is to provide the building and floor details to the GoIndoor library. 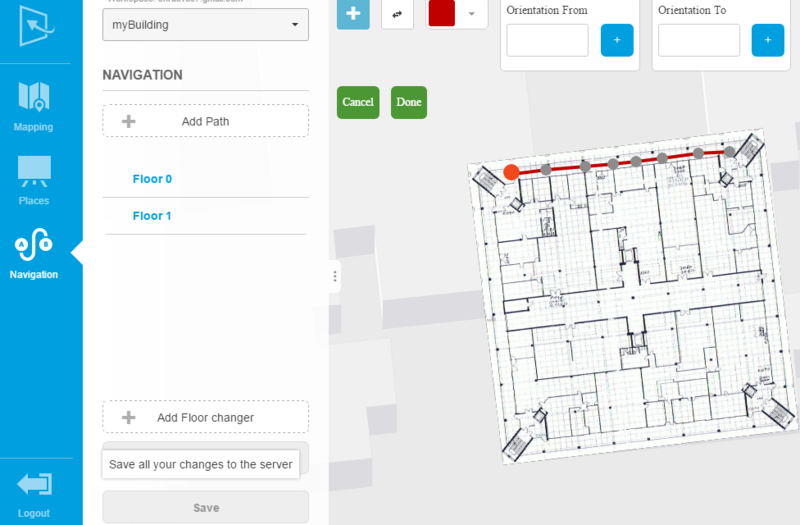 Go to the 'Mapping' tab and use this console to create your building and add floor details. 1. Go to the 'Mapping' tab from the left panel and click on the ‘+’ icon next to the ‘Create building’ drop down widget on the top of the page. 2. 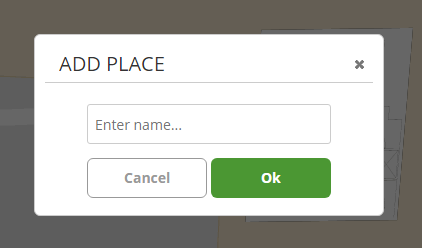 Provide building name and location on the following pop up screen. 3. Click ‘Create Building’. This will create a new building. 4. All the buildings created will be shown in the drop down box at the top of the page. 5. You can edit or delete the building by opening the drop down menu and clicking the edit and delete icons respectively, shown in front of the building name. After creating a building, you can set up its floors. 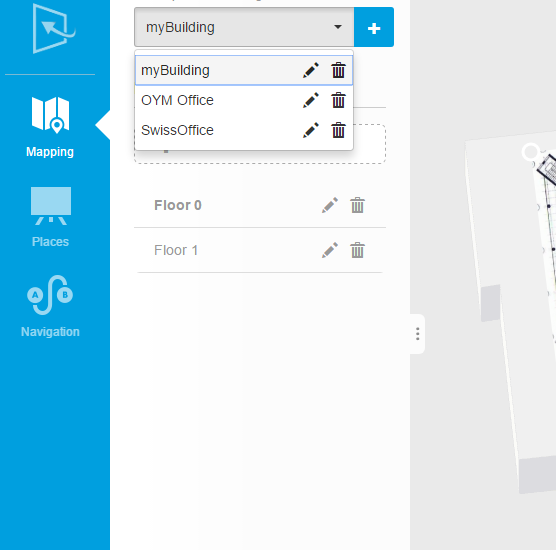 When a building is selected from the drop down menu on the top of the page, the existing floors for that building are listed under it. 1. 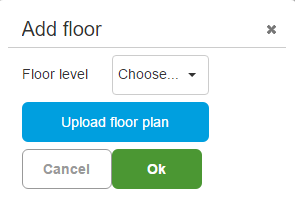 Click the ‘Add Floor’ button. 2. Enter the floor number and upload its detailed plan on the following page. 4. Overlay the floor plan precisely on the underlying map . The floor plan image will show up on top of the map with three white dots. Decrease the overlay opacity and place those dots on the end points of the building. The 'Keep Image Ratio' switch on the map facilitates accurate placement of the plan on the map. It changes the way user can interact with the plan. When the switch is ON , the image vertex will be shown in blue and the user can resize the plan. With the switch OFF, three of its corners will be shown in white and can be moved to change the geometry of the plan, as needed. 5. Once the plan is properly placed, it appears as shown below. 6. The added floor shows in the floor list for the building. 7. Click ‘Save’ to save the information on the server. 8. You can add any number of floors to a building by repeating the steps listed above. Note: Use the zoom features on the map to precisely mark the floor on the end points of the building. If you reach the maximum limit in satellite view, switch to the normal view. 1. Click the edit icon in front of the floor name in the floor list. 2. It shows the edit floor page. 3. Make changes as required and click Ok.
4. Click Save on the bottom to save the changes on the server. 1. 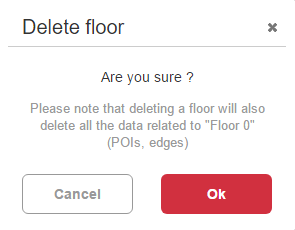 Click the delete icon in front of the floor name in the floor list. 2. Click ‘Ok’ on the confirmation page. A POI is a point or specific zone which may be interesting or useful to the visitors of the location. POIs can also be referred to as Places. For example, with reference to a university campus, the labs, library, canteen etc. may be referred to as POIs. A POI can be a single point like in case of an ATM or a bigger area like a conference room in an office. This section will explain how to add Places Of Interest (POIs) on your map. To manage places, click on the 'Places' tab in the left pane. 1. 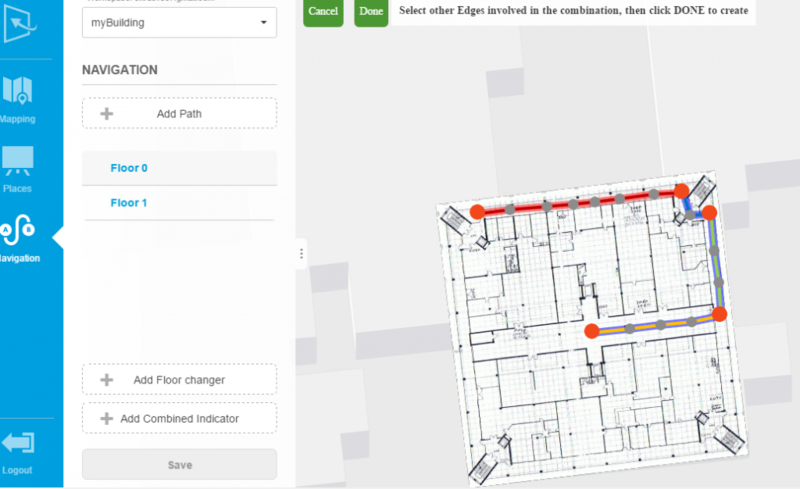 Select the building and the floor where a new place is to be added. 2. This enables the 'Add Place' button. Click it to add a new place. 3. There are three types of place markers to choose from to mark your POI on the plan : pointed marker, circular marker or polygon drawer tool. - to mark a single point on the plan. - to define a circular region. - to define a polygonal area. 4. Choose the appropriate marker and give it a name. 5. Place the marker on the plan appropriately. The following sample image shows a circular place marked on the plan. 6. 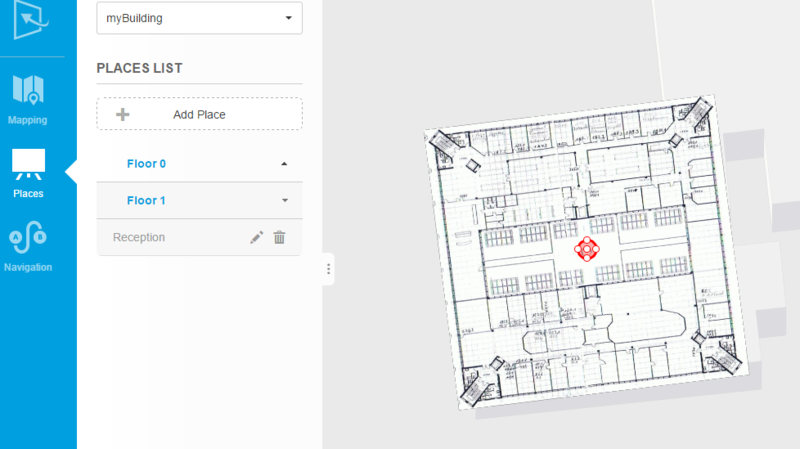 You can now edit the place to enter its properties, tags, color and associated notifications. 8. Repeat the steps listed above to create any number of places for a floor. All the POIs for a floor will be listed under the floor. 9. The position or boundaries of the POI can be changed any time by clicking on it. 10. Click Save after making all the changes. To edit the properties of the POI or delete a particular POI, click the edit or delete icons in front of the POI name. 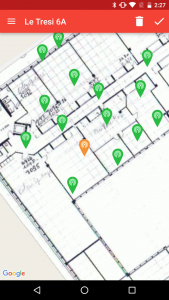 Properties: Properties can be used to save additional information about the POIs. Like, if an area indicates a restaurant, you can use the property fields to store its opening and closing timings. This information can then be used in any way in the application. The SDK passes this information as it is to the applications when place information is fetched. Tags: Tags can be used to save any attributes of a place. These tags can be used in the applications to group similar places, search through the places or for different graphical representations of the places. For example, if all the POIs which show doors marked as emergency exits have same tag, let’s say, ‘emergency_exit’, then the application can be coded so as to show these gates in a particular color on the map. The application can query the SDK with these tags to fetch only particular type of places. Notifications refer to different geolocalized events associated with a place or POI. There are four types of notifications that you can associate with any POI through the Admin Panel. Enter – triggered when someone enters a particular POI. Leave – triggered when someone leaves a particular POI. Stay – triggered when someone is inside a particular POI and has stayed there for atleast a specified duration. Nearby – triggered when someone passes nearby a particular POI. You can create any number of notifications of these types to be sent to the visitors. These notifications are triggered by the SDK when the specified event happens and sent to the applications. It is then up to the application to handle them appropriately. Notifications can have any number of properties associated with them. Properties are key value pairs which can be used by the developers in any way relevant to their application. For example, if they want to show a promotional ad, the key value pairs can be ad and its link respectively. Any properties associated with a notification is sent to the application when it triggers. 1. Select the POI and click edit. 2. Go to the Notifications tab. 3. Select the type of notification to be added (enter, leave, stay or nearby) and click ‘Add Notification’ to add a new notification. 4. Add properties to that notification as required. 5. You can also add filters to select your target audience for the notification. Click on icon and add filters to the notification. Choose the appropriate criteria and enter its value. This property and its value will be evaluated before sending a notification to a particular user. You can optionally mark it as a mandatory filter too which indicates that a particular criteria should be fulfilled for the notification to be sent. Please note that the filter criterion shown in the drop down are the default user properties, which can be modified through the settings page. 7. For ‘STAY’ type of notification, there is an additional property, ‘Delay’ that can be set. It specifies how long to wait before sending the notification once the user has entered the place. Click the edit icon and set its value. The unit for this time attribute is seconds. 8. Similarly, for ‘NEARBY’ type of notification, there is an additional parameter, ’Distance’ that defines what can be the maximum distance of the user from the place when the notification is triggered. Its unit is meters. Navigation refers to the planned movement from source to destination, following a route. An edge represents a path on the map which can be used to navigate a user from one point to another. A route is a network of such edges traversed between source and destination. 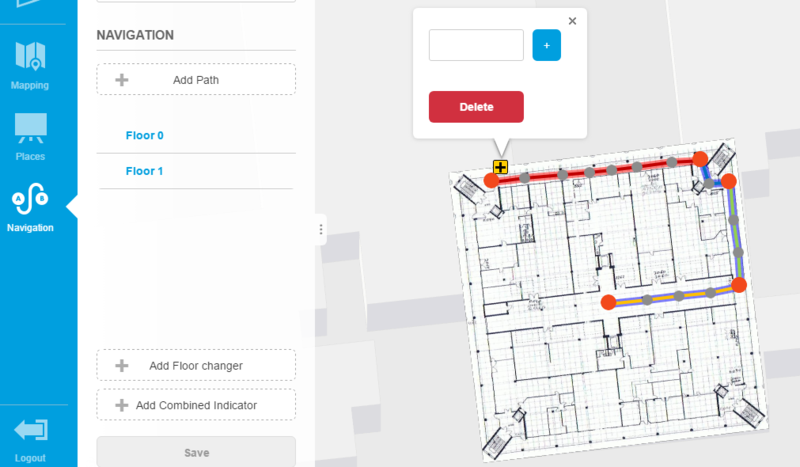 Navigation section of the Admin Panel allows you to define feasible paths inside a building which are required by the SDK while finding a suitable route for a user inside the building. An edge can have any number of properties. These properties provide extra information about the edges. This information is used by the SDK to compute specific navigation routes for users based on their profiles and specific needs. For example, if the SDK is computing a path which is wheelchair_accessible, it will only look for edges where that property is true. Please keep the following points in mind while creating your edges. Orange dots mark the beginning and end of an edge. Grey dots are used to create curved paths. Crossroads can be created only from the orange dots. Any intersection which is not over an orange dot is considered as a bridge and hence the application will not allow a left or right turn at that intersection. 1. Go to the Navigation tab on the left. 2. Select the floor for which edges are to be added. 3. Click on ‘Add Path’. 4. Enter the details for the path to be created in the following screen. 5. Select the property to be applied to the path from the drop down menu. The chosen properties will be listed below. 6. Choose a color to be shown for the path. 7. Select icon if the path is a two way/ bidirectional path. 9. Click on the map from where this path is to begin. It will be indicated as an orange dot on the map. 10. Continue to place points on the map. All the dots will be shown in grey. Once the end point of the path is reached, press ‘Done’. The end of the path will again be shown in Orange. 11. You can also add indicators to any edge. They are used to associate extra information to any edge. An indicator is an object with an image and a text. Each edge can have two indicators. These will be used whenever system has problem detecting your direction. For example, at crossroads, when the system knows your exact position but does not know the direction you are facing, it may be difficult to generate instructions like 'turn left' or 'go straight', in such cases these indicators can be shown to eliminate ambiguity. Above is a sample indicator used when the system has to indicate the path to be taken but is not sure whether to indicate it as 'slight left' or 'straight' with respect to the direction user is facing. Indicators can be added to any edge through the 'Orientation From' and 'Orientation To' inputs while creating the edge. Enter the associated text in the textbox and click '+' to upload associated image. 12. The newly created path will be shown like this on the map . 13.To edit or delete an edge, click anywhere on the edge, the red line in the above example and click the edit or delete icons. 14.Continue to mark all the feasible paths on the floor plan to create the whole navigation network. 15. Click ‘Save’ after making all the changes. When a building has more than one floor, add floor changers to indicate the possibility of movement from one floor to another. Floor changer can be escalators, elevators or stairs. 2. Click on ‘Add Floor Changer’ button. 4. Select the type of floor changer to be added. 5. 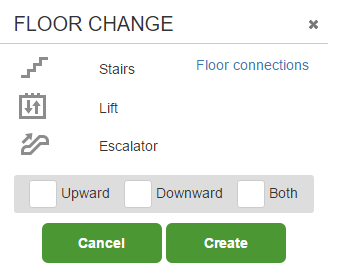 Click on ‘Floor connections’ and choose the floors to be connected by this floor changer. 6. Choose the direction of the floor changer. 8. 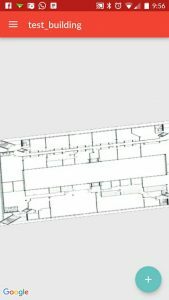 Place the floor changer appropriately on the floor plan. 9. Click on ‘Save’ to save it to the server. Combined indicator refers to an indicator which is assigned to a group of edges and not a single edge. A combined indicator is also an object consisting of an image and a text. It is used whenever it is a simpler to explain the path through an indicator instead of using the instruction set for the route.For example, assume the navigation route consists of a big hall to be crossed with a series of turns and nodes. 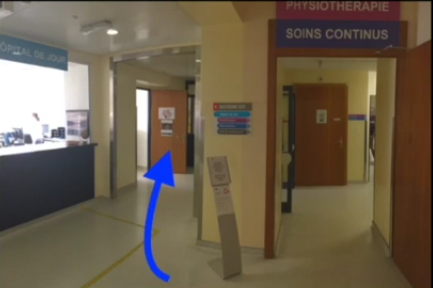 In such a case, it may be simpler to show "Reach the exit gate 5" along with the image of the referred gate or something similar, instead of giving multiple instructions to cross the hall. Choose edges linked together in series. There can be only one main edge and other edges forming a path in continuity. The edges chosen for combined indicator should not form a loop. There should be no crossroads in the chosen edges. 1. Click the first edge to be included for the combined indicator. It will be referred to as the 'Primary edge' and will be indicated in red color. 2. Click the remaining edges in continuation. Those will be referred to as 'Secondary edges' and will be shown in blue color. 3. Click 'Done' button on top of the page when all the involved edges are selected. 4. Add an indicator to the set of edges chosen. To delete the combined indicator, click on '+' icon of the indicator and click 'Delete'. Please note that deleting any edge which is part of a combined indicator will delete the combined indicator automatically. 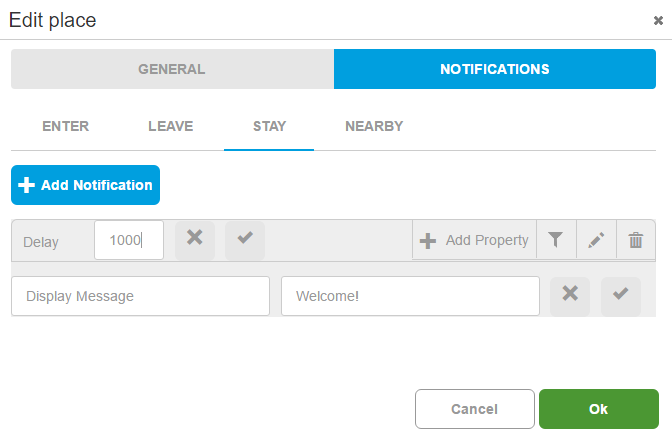 The application allows us to add custom predefined properties to places, edges, notifications and users. Once a predefined property for any of these objects is created, it will be automatically be associated to the newly created objects of that type. This not only saves time while creating newer objects but also makes them uniform across similar objects and thus reduces scope of error. For every new object created, only the value of the property will have to be set. For example, if we define a predefined property for an edge ‘wheelchair_accessible’, then for every new edge created, we will only have to specify if this property is true or false for that edge. 1. To make these settings, click on Settings icon shown on the map under 'Places' and 'Navigation' tabs. 3. Add appropriate settings for places, notifications, edges or users. 4. Provide iBeacon' proximity UUID, if required. This attribute is required by the iOS devices to be able to hear the iBeacon devices. Android devices, on the other hand, can hear all the beacon devices without any limitations. Please note that the default value of this field is set to UUID of the beacons provided by us. Change this attribute if you are using your own beacons with a different UUID. 5. Click ‘Save’ to store these properties on the server. The properties associated with places, edges and notifications are used to save additional information about them. These properties can be used in different ways in the applications to offer customization of UI and tasks. For example, a property ‘alert_type’ could be associated with notifications to inform the application how to alert the user when that notification is generated. The user properties, on the other hand, are used to create a set of properties (of type - number/ string/ fixed values) that can represent a user profile. These user profile properties are used by the notifications to set filter targets. When a notification is defined, any set of user profile properties can be used to choose the subset of people to which that particular notification should be sent. Beacons form the baseline of the indoor locationing technology. Hence, Beacon placement is a very important part of the set up. Follow the best practices guide of beacon placement to achieve optimum results. Beacon placement is a very important step to ensure that the desired accuracy is achieved. 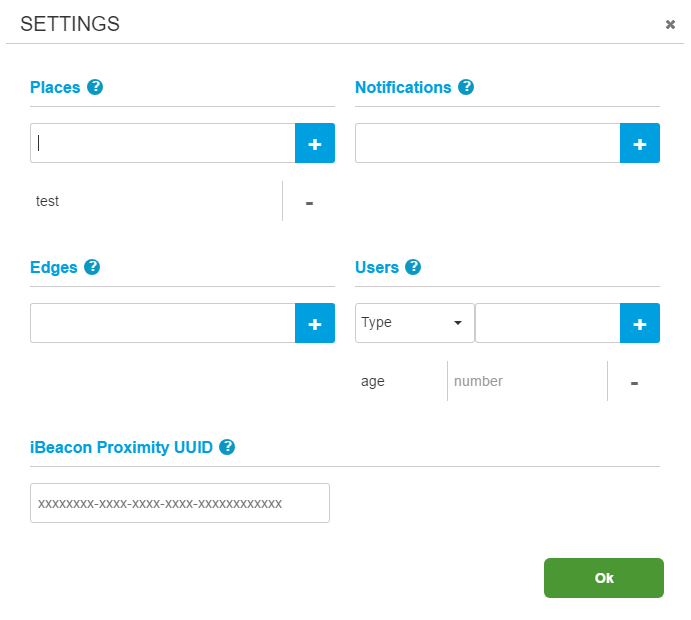 Number of beacons, their orientation and the height at which they are placed are some of the factors that contribute to the overall performance of any beacon based indoor locationing system. Keep the following factors in mind while placing the beacons. The way beacons are oriented has a huge influence over the signal strength. One common mistake is to test beacons by only putting them on top of a furniture for example. If the beacon is oriented upwards, the signal is strongly weakened. Orient them correctly by sticking them to the ceiling or on a wall for best results. Tx power and update rate are the two parameters that define beacons. The Tx power has an influence on the beacon range and the update rate influences the stability of the signal. Having a high tx power can drain the beacon battery really fast. At the same time, its signals wont be useful to far away devices because it's hard to compute distance to a beacon beyond 20 meters. Not hearing a beacon can be a valuable information but hearing too many of them can decrease the location stability. For a lot of buildings, we use -77dBm and 300ms for tx rate and frequency. To avoid having an obstacle between your device and the beacons, put them at least at 3 meters high to get a clear line of sight. At a height of 5 meters and more, the signals are weakened. In that case, increase the tx power from the default settings ( around -77dBm ). Signals can be blocked or absorbed by obstacles. Metals and water have a great effect. Even extreme temperatures can affect the signals of the beacons. Too few beacons may leave some places in your location uncovered. At the same time, too many beacons can affect the accuracy of the position computed. Buildings usually consist of rooms and corridors. For rooms, it depends on what you want to achieve. 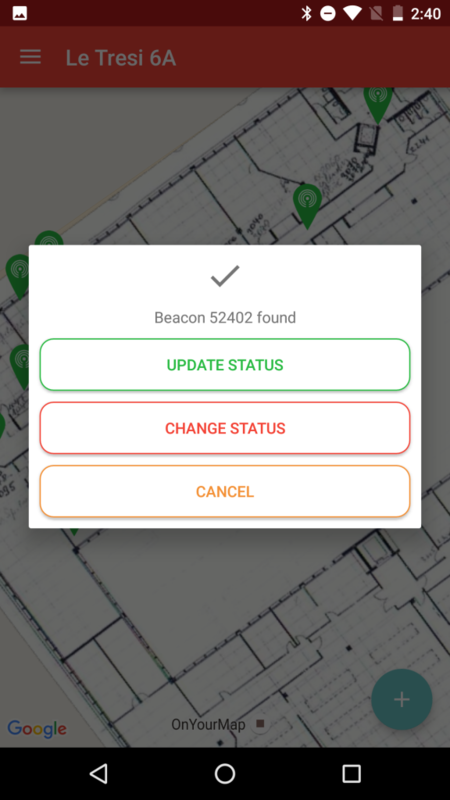 Usually for a room, one beacon is enough to be able to navigate to the room or trigger notifications based on it. You may also choose to put beacons in the corridors outside the room if only navigation to that room is the requirement. Sample - rooms equipped with one beacon each. 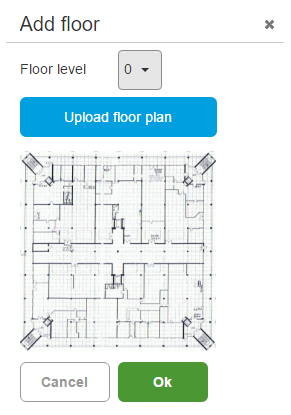 For corridors, it is best to put beacons on the ceiling every 10-15 meters. If however, you can't put them on the ceiling, put them on the wall. Put one beacon on the left, the next one on the right, and repeat the process. Remember to always put one beacon at crossroads. Accuracy is better when you're close to a beacon, and this type of location is important for navigation. In such spaces, where you have to place many beacons to cover the whole place effectively, factors such as interference come into the picture. Play with signal strength to reduce overlap. The best practice for such places is to create a symmetric beacon grid to cover the whole place. The density of the grid will define the accuracy in locationing. As a best practice, it is recommended that the distance between each beacon should be between 10 and 20 meters. When beacons are 10 meters apart, it will give you an accuracy of around 2 meters. 20 meters will give a 5 meters accuracy. With such a setup, an area of 10,000 square meters can be covered either by 121 beacons (11 x 11) or 36 beacons (6 x 6) depending on the accuracy needed. 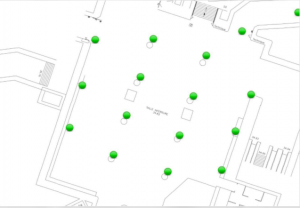 If however, the location is too huge and needs thousands of beacons to be installed which may not turn out to be cost effective, spot the best locations like POIs, entry and exit places. 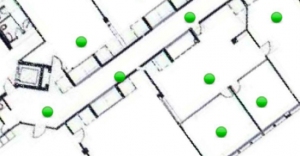 If the areas to be covered are not symmetric or need to be given special attention like a reception area or the turn of a corridor where the location is bad, extra beacon may be added to enhance their coverage. For areas less than 40 square meters, our advice is to use no more than one beacon. 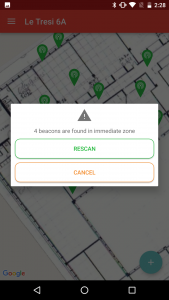 For small rooms where beacons are required inside, place them as far as possible from the entrance so that they cannot be heard outside the room. You could also choose to lower the Tx power of that particular beacon. While changing levels, it is advised that one beacon is placed near the start of the stairs, escalator or elevator and one near its end. This will give you best accuracy and make floor transition faster in the application. If the stairs are too long, we may need another beacon in the middle as well. 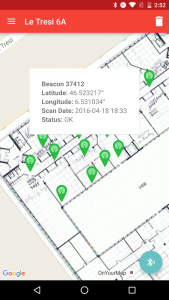 GoIndoor SDK needs the information of the beacons placed in your building to provide you useful indoor locationing information. 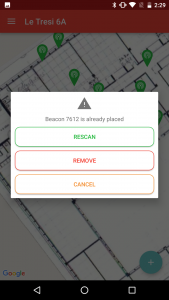 This can be done easily with the help of our free and easy to use ‘quick set up’ tool to install and manage beacons in your building. 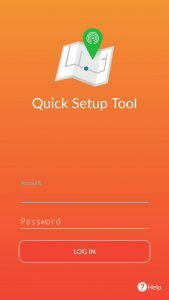 Quick Set Up Tool is a mobile application for easy installation of beacons in your location. It is available for android devices currently. It supports both ibeacon and eddystone beacon protocol. 'Quick Set Up Tool' needs the following permissions on the device to run. 2. Install the application on your device. 3. Go to https://www.goindoor.co/freetrial and request for your credentials. 1. After the application is successfully installed on the device, login using the credentials given to you. 2. 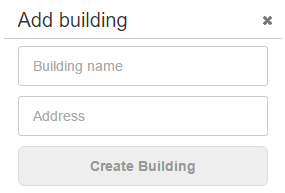 After login, it will show the list of buildings that you have created through the Admin Panel. 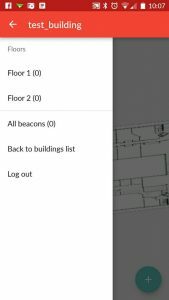 Select the building in which you are placing the beacons. 3. It will show the plan of the lowest floor in the building. 4. You can change the floor or go back to the buildings list by clicking the menu icon on the left of the building name. 5. 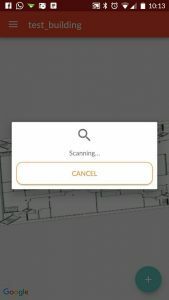 Press the icon on the bottom right of the screen to scan a beacon to be placed. 6. When the beacon is successfully scanned, following screen appears. Click on the Add button and place the beacon at its physical location. 7. Mark the same location on the plan where you have placed the beacon. Once properly marked, select the icon to store the beacon. The beacon turns green in color once its information is saved on the server. 8. Repeat the above steps until all the beacons are placed. To delete a beacon, select the beacon. It will show its current status. Press the trash icon on the top of the page to delete this beacon. Do not forget to remove the beacon from that location physically as well. To move a beacon, select the beacon and press it for long on the screen. It will turn orange in color which indicates that it can now be moved from its original place. After placing it at its new position, click the save icon on the top. Once moved, do not forget to move the beacon physically as well. 1.If the beacon is not scanned properly, following screen will appear. In this case, rescan the beacon. 2. When you scan a beacon and there is another beacon in the vicinity, following screen appears. In this case, isolate your beacon and scan it again. 3. If the beacon being scanned has already been scanned before, following screen will appear. So, either you remove this beacon first or scan another one. Select a beacon and click on it. It will show a set of details of the beacon like last scanned time, status, geolocation etc. The '+' icon on the bottom will change to icon. Click on the icon to start listening to the beacon if its emitting. If the beacon is found, following screen appears which allows you to change the status of the beacon, if needed. The beacon can be one of the following status at any time. Please note that the device communicates to the beacon through bluetooth, hence it will be able to listen to the beacon only if they are close to each other. Welcome to GoIndoor SDK which allows real time beacon based indoor locationing and more. This SDK will help you build smart applications without the need of understanding complex algorithms of indoor locationing. This guide will help you integrate GoIndoor technology with your application easily. 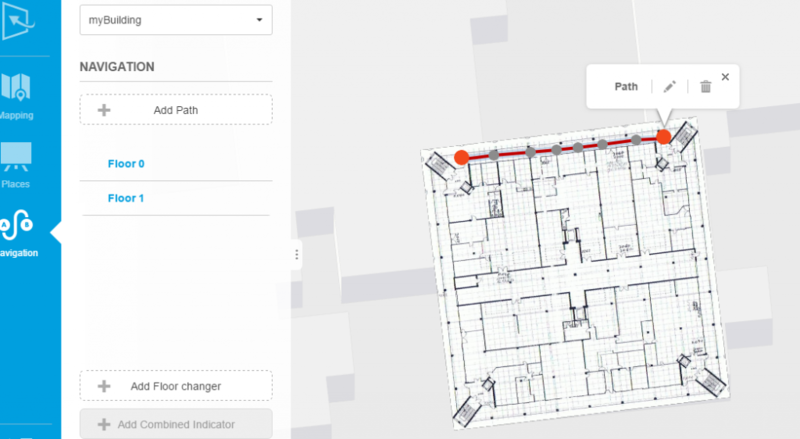 GoIndoor SDK is a set of tools for building precise location services for indoor places. You can achieve an accuracy of upto 2 meters with our SDK. Our SDK makes use of the signals from the beacons to calculate your position. It is implemented as a wrapper to the native GPS location services available in the devices. The SDK will provide indoor location if beacons are available, otherwise it will change to GPS. The developer can thus rely on single set of APIs in our SDK for indoor/outdoor geolocation. We offer native SDKs for both Android and iOS devices. GoIndoor Cordova plugin is also available but it is in beta state and offers limited features. For Android devices, Android version 4.3 (API level 18) or later is required. For iOS devices, iOS 7.0 or later is required. If you want to see a running application before writing your own, download our sample app ‘Indoor Navigator’ and get started. It demonstrates features like user location, routing, notifications, indoor maps and more. You can also download the code, build and run it locally. Download the iOS sample from here and the android sample is available here. Following sections show how to implement basic locationing related functionalities in android applications. For an extensive list of classes and methods exposed, refer this. The GoIndoor library can be downloaded from the jcenter and maven central repositories. In Android Studio, if you wish to add GoIndoor library to your application, add the following line of dependency in module's build.gradle file. Android Studio then automatically downloads this library from Maven Repository Server defined in build.gradle. 1. First of all, download the latest version of Goindoor-x.y.z.aar file from here. 2. Next step is to import .aar file. Add the .aar library to the libs directory of the module (it is located in the same level as the java and res folders, create the folder manually if it does not already exist). GoIndoor SDK is available to the project. 1. Start by creating a new Android Studio project. Name it appropriately. 2. Set “Minimum SDK” to “API 18:Android 4.3 (Jelly Bean)”. 3. Choose “Blank Activity” to begin with. 4. Add SDK dependency as shown in the previous section. 5. Make the following changes in AndroidManifest.xml. Set the “Minimum SDK” for the application. To be able to use Bluetooth and Google Location Services, add the following permissions. To allow the application to use Bluetooth Low Energy (Bluetooth 4.0) feature, include the following line. Finally we need to define the Indoor Location Service to be used, which can be defined as follows. 6. Ensure that Bluetooth and WiFi/Network connection features are available in the device. 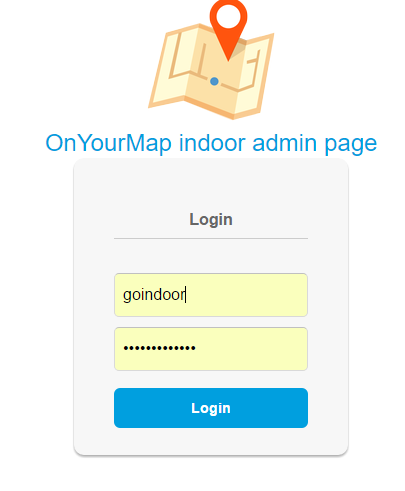 The first step to access GoIndoor's features is to create a GoIndoor object. Use the build() method of GoIndoor.Builder class to create the object. In the backend, it will try to connect to the server and synchronize with it. The connection status with the server will be notified through the ConnectCallback object, provided as an argument to the build() method. Create a GoIndoor object . callbackConnect – ConnectCallback object to handle the connection process. It is mandatory to set the account, password and callback parameters in the builder class. If context is not provided, the default one will be used. There are few other optional parameters which can be set in the builder class, if needed. The GoIndoor.Builder class exposes various setter methods for all the parameters. setAccount(String account) - Sets the account name. setConnectCallback(ConnectCallback connectCallback) - Sets the callback to handle the connection process. setContext(Context context) - Sets the indoor backend URL. setDatabaseUpdate(long refresh) - Sets the database update rate in msec. setDebug(boolean debug) - Sets the debug mode. setLocationType(int type) - Sets the positioning type. setLocationUpdate(long refresh) - Sets the location update rate in msec. setPassword(String password) - Sets the password. setProfile(String type) - Sets the profile to be used. setUpdatePolicy(int policy) - Sets the update policy. setUrl(String url) - Sets the app context. A sample ConnectCallback object is shown below. 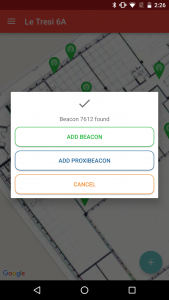 When an application first connects to the server, it automatically downloads information about beacons, buildings, floors, POIs, notifications and assets to the device. This not only makes the application more efficient but also provides it offline capabilities. The SDK continues to synchronize with the server in the background at regular intervals to fetch updates, if any available. In order to start the location services , it is required to provide a LocationBroadcast to the library. This will be called each time a position is computed or a new notification is triggered by the SDK. The LocationResult object has the following information about the new location. When ConnectCallback.onConnected() is invoked, it indicates a successful connection with the server. GoIndoor location service should now be started to start receiving location updates. After starting the service, every time a new position is computed, LocationBroadcast.onLocation() is invoked and every time a notification is triggered by the SDK, LocationBroadcast.onNotification() method is invoked. When you no longer wish to receive location updates, stop the location updates using this method. Before exiting the app, close the session with the server properly using the following call. The location updates can be used in different ways in the code - to mark the location on the map, find distance from a particular place or to save the coordinates for analysis. Following code snippet shows how to use the location update to mark the location on a map. Go through the 'Show Indoor Maps' section to learn how to overlay your indoor map over Google Maps. There are three types that you can set for the location updates that you wish to receive. These differ in the algorithms which are used to derive the location. Use the following method to set the type. 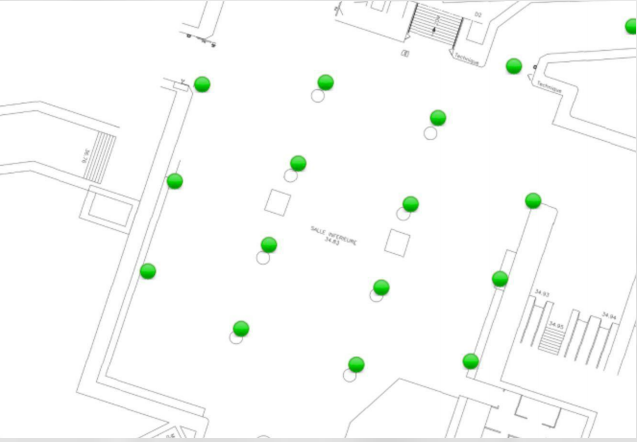 LOCATION_TYPE_AVERAGE – In this case, signals from multiple beacons are used to triangulate the location. LOCATION_TYPE_CLOSEST – In this case, the location is calculated by using only the signals of the beacon which is closest to the user. LOCATION_TYPE_PROJECT - In this case, weighted average of signals from multiple beacons (as in the case of LOCATION_TYPE_AVERAGE) is used to determine the location which is then projected to the closest edge. A notification is a kind of event that happens when a specific action happens with respect of a Point of Interest (POI). Different notifications can be configured for a POI using the Admin Panel. SDK generates notifications when those specific events occur and it is the responsibility of the application to handle them appropriately. Please note that the notifications generated by SDK are not push notifications on the phone. The LocationBroadcast object exposes onNotification() method which is invoked every time a notification is generated. This method can be used in different ways to handle notifications. The notifications can also be filtered further based on user profiles. Enter – This notification is generated when the device enters the POI. Stay – This notification is generated when the device has been inside the POI for a specified time period. 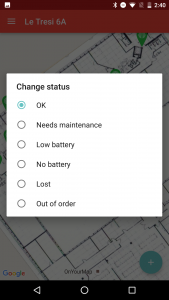 Leave – This notification is generated after the device has left the POI. Nearby – This notification is generated when the device goes near a POI. Trigger an action on a specific notification: The following example shows displays a message to the user if his current location is close to exit (POI in this case) and the user is about to leave the place. 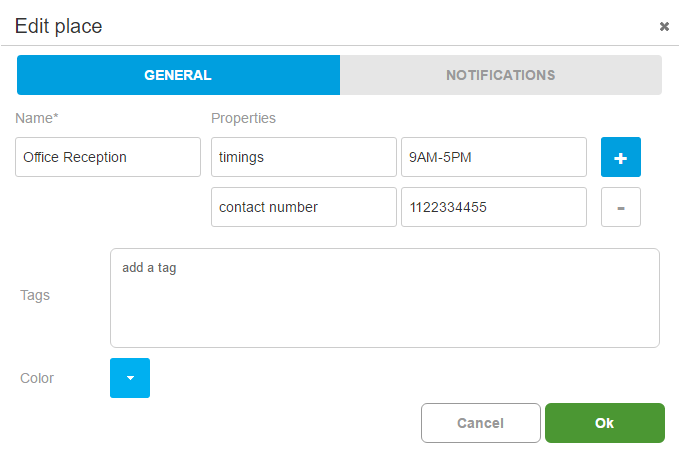 You can also associate any number of properties with every notification. These properties can be used by the developers in any way in the code. Filter notifications based on user profiles: Notifications can also be sent to specific users based on their profiles. For this, while configuring a notification from the Admin Panel, add a target to it. Target can be set based on user profile like age, gender or any other property. Update the user profile on the server. See the related sample here. The SDK will then automatically trigger notifications based on the profile. For example, if a notification is to be sent to adults above 21 years of age only, then update the user's age on the server through the application and while creating a notification on Admin Panel, add age property as a filter to it. The SDK will now send that notification only to users which fulfill the age criterion. Navigation is the process of finding a route from one point to another. Our SDK supports only indoor navigation. It provides the optimal shortest path for the user to navigate from the starting point to the desired destination. The navigation API returns the routing points or the roadmap to be traversed along with the estimated time it will take to reach that place and distance to be covered. Please note that the route/navigation path is returned as a list of instructions which can then be used by the developers to display in their application as needed. How to use Navigation API ? 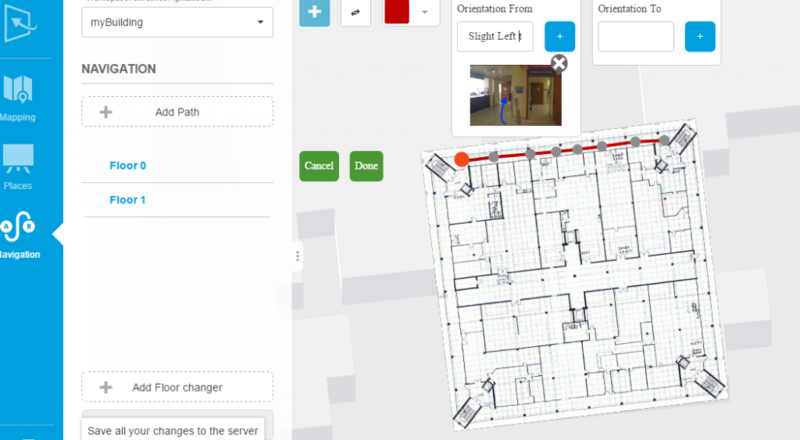 Use the computeRoute API from GoIndoor class to compute the navigation route. It takes two RoutePoint objects to specify the two points between which the route is to be computed. This method returns a route object. The route object has the following information. route – List of RoutePoint containing the route. arePropsFulfilled - flag to indicate whether route could be computed or not. Following code shows how to compute the Route between two points, assuming that the source is the current user location identified with variable 'location' and destination is a POI identified by variable 'poi'. Route returns the optimum shortest path between the two points. This information can be now used to get instructions for navigation on the route. Instructions are messages to be shown to the user for navigation like Turn left, Go straight and so on. The following code shows how to get the projected point and the next instruction from the route. The localization support currently includes the instruction strings in English, French and Catalan. It is done through the InstructionAdapter class which converts an Instruction object into a human-readable string and icon. It is a good practice to check the arePropsFulfilled flag before using any route object for navigation. This indicates if all the properties were fulfilled to compute a route. If the flag is false, it is advised to recompute the route. Similarly, when the user location returned by getProjection method is far from the edge, it populates a field 'isRecomputeRequired' to indicate that the user should recompute its route. This field should be checked before using the projected point for navigation. A point of interest or POI is a specific zone that someone may find useful or interesting. In our guide, terms place and POI are synonymously used. Some examples of POIs in a hotel would be restaurants, parking spaces, reception area, gym. Our SDK aids the user in finding specific places or find information about the points of interest he is near to. Point - When the Point of interest can be defined by a point on the map. For example, an entry or exit gate. Circle - When the POI covers a circular area. It is identified by a particular point and a radius around it. Polygon - When the POI is of polygon geometry and is defined by a list of boundary points. Place object contains all the information about a poi like building id, floor number, latitude, longitude, geometry, properties and tags. Use getPlaces method to fetch the places in the location. You can specify tags and filters to add search criterion. The is an overloaded method and can be used in a number of ways to get the places. For more details, refer this. Consider the following example where this method is used to fetch the closest place in the location. Assuming the current location of the user is 'location', specify the radius from the location as zero and tags and filters as null as there is no specific search criteria in this case. Tags : Tags are used to save attributes of a place. These tags can be used in the applications in different ways, like, for grouping similar elements, searching through the elements or for different graphical representations. For instance, if you want to show all the emergency exit gates in your building in red color, add a tag to all of them as ‘emergency_exit’. In the application, fetch all the places with that tag and show them in red. Following example illustrates a simple usage of tags. This code snippet shows how to get list of all the exit places. Assuming the exit gates (POIs in this case) have been tagged "exit_gate", to get the list of all the exit gates in a building with buildingID as '1e76b0ac-2e19-4c18-84a9-b5b2e66b6e7f', add the following code. Properties: Properties are used to save additional information about the points of interest. For example, for a place like reception, add a property 'operating_timings' and save its operating timings as its value. This information can then be used in any way in the application. Tracking can be done by logging the location of the user on the server frequently. This can be done using the logPosition method of the Logger class. Every time there is a change in location, onLocation method of the LocationBroadcast is invoked with the new location attributes. Once the new location is received, use logPosition() to log the position to the server at a certain frequency. This method sends user's location details to the server in the form of LocationResult object. Our SDK can help you customize the user experience based on their profiles. For this, the user's profile needs to be updated on the server. An example would be to send different notifications to different users. This customization is based on the user properties defined in the Admin Panel. Assume you want to send a notification that is suitable to only visitors above 18 years of age. In this case, you can configure the notification in the Admin Panel and set the target based on age. From the device application, update the user information (age, in this case). The SDK then takes care of triggering the notification only when the user profile satisfies the age criteria. Following code sample shows how to update a user property on the server. Assuming that in the Admin Panel settings, there is a user property called age of type number and user's age is defined by a variable 'age', this code snippet updates user's age to the server. The same method putStatsProp can be used to update any user property to the server. Another use case of maintaining user profiles is to compute multimodal routes. In this case, user specific values of the properties of the edges are to be updated on the server so as to compute appropriate navigational paths. This value can be updated by using putNavProp method. This method updates the value of an existing navigation property for the user by providing its key (a.k.a. the exact name as defined in the Admin Panel) and the new value encoded inside a UserValue object. Currently, it can only supports a BOOLEAN as value. Below is an example which shows how to indicate the SDK that a wheelchair friendly path should be computed for the current user. Assuming the related property of the edges is called 'wheelchair_accessible', we are setting its value to true. There is another overloaded method to store a bunch of properties together. Refer this for more details. In order to show an indoor map overlapped in Google Map, first step is to initialize a GoogleMap object called map as explained here. Next step is to get the UrlTileProvider for the floor in question. The GoIndoor library includes a list of the buildings available for the account. Every Building object includes all the floors available for that building. Floor object has the information of TileProvider for indoor tiles. In order to access the UrlTileProvider for a floor, use getGMTileProvider() method . The following example shows how to do it. Once the UrlTileProvider is available, it can be directly added to the map using the method shown below. 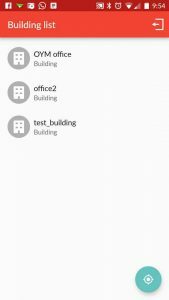 Following sections show how to implement basic locationing related functionalities in iOS applications. For an extensive list of classes and methods exposed, refer this. 1. Download latest version of the GoIndoor iOS SDK from here. 2. Drop the Goindoor.framework directory to the Xcode project. This will make the GoIndoor library available to the project. 3. Copy routing.bundle directory also to the Xcode project. This provides icons and strings to the routing framework. For the SDK to work, it needs Bluetooth and WiFi/Network connection support from the devices. Ensure these features are available. 1. Create a basic iOS app. 2. Set the Base SDK version to iOS7. 3. Add –ObjC flag under the Linking section of the Build Settings tab of your Xcode project. The first step is to create a new instance of the GoIndoor library. This can be done through the goIndoorWithBlock method of OYMGoIndoor class. Here, it tries to connect to the server and synchronize with it. The success or failure of this method is notified by the callback method provided. callback – callback method to handle the connection process. It is mandatory to set the above three parameters in the GoIndoor library to get its object. There are other optional parameters that can be set through the following methods exposed in GoIndoorBuilder Protocol. setURL: Sets the Goindoor backend URL. setUser: Sets the profile to be used. Default is user. setConnectCallBack: Sets the callback to handle the connection process. setLocationType: Sets the positioning type. Default is kOYMGoIndoorLocationTypeAverage. setLocationUpdate: Sets the update rate in msec. Default is kOYMGoIndoorDefaultLocationRefresh. setDebug: Sets the debug mode. Default is false. setUpdatePolicy: Sets the update policy. Default is (kOYMGoIndoorUpdateWifi | kOYMGoIndoorUpdateMobile). setDatabaseUpdate: Sets the database update rate in msec. Default is kOYMGoIndoorDefaultUpdateTime. 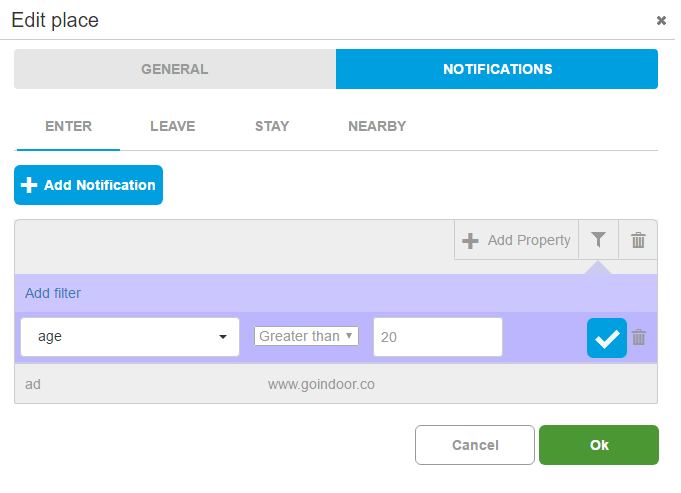 In order to use GoIndoor location library, define a delegate class that conforms to the OYMLocationDelegate protocol. If the Location provider is successfully initiated, didStartSuccessfully method is invoked and in case of failure/exception, didFailStarting is invoked. On successful initialization, onLocation method of this delegate is called each time a new position is computed and onNotification is called each time a new notification is triggered. *  This delegate will provide feedback to the user regarding the indoor location library. * start the indoor location service. *  This method is called when a new position is available. *  This method is callen when a notification is triggered. *  This method is called when the app has not the right authorisation for the Location Services. *  This method is called when the Location Services are disabled. *  This method is called when the Core Blueooth Central Manager state has changed. The location is sent by the library as OYMLocationResult object which has the following fields. To start receiving location updates, provide an object that conforms the OYMLocationDelegate protocol to startLocate method of OYMGoIndoor object. After starting the library, the onLocation method of the delegate will be invoked whenever a new position is computed. In order to stop receiving location updates, invoke the stopLocate method with the same delegate object. In order to properly stop the library, it is necessary to call disconnect method. There are three positioning types that you can set for the location updates that you wish to receive. These types differ in the way SDK computes the location. Use the following method to set the type. 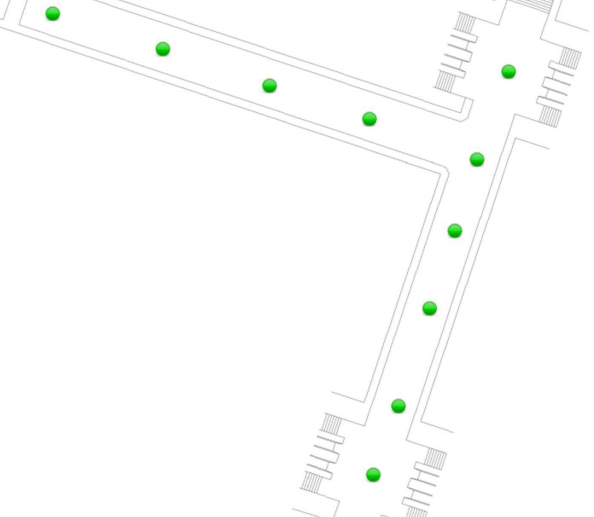 kOYMGoIndoorLocationTypeAverage - Weighted average of the signals from multiple beacons is used to triangulate the location. kOYMGoIndoorLocationTypeClosest - Location is calculated by using only the signals of the beacon which is closest to the user. 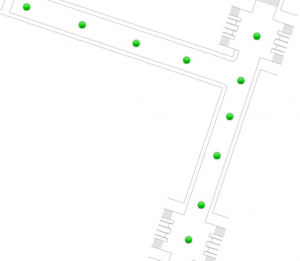 kOYMGoIndoorLocationTypeProject - Weighted average of signals from multiple beacons (as in the case of kOYMGoIndoorLocationTypeAverage) is used to determine the location which is then projected to the closest edge. You can use the coordinates obtained from Indoor Location provider to do various things. One of the most common use cases is to show user's current location on the map. Refer the 'Show Indoor Maps' section to learn how to display indoor maps. Our SDK allows easy integration with both Google Maps and Apple's MapKit framework. In the following example, we are displaying user's location in Apple Maps. Navigation is the process of finding a route or way between two points. Our SDK supports only indoor navigation. It provides the optimal shortest path for the user to navigate from the starting point to the desired destination. The navigation APIs return the routing points or the roadmap to be traversed along with the estimated time it will take to reach the destination and the distance to be covered. Please note that the route/navigation path is returned as a list of instructions which can then be used by the developers in their applications as suitable - display on the UI, draw indicators etc. In order to create a route between two points, these points need to be encoded inside a OYMRoutePoint object. arePropsFulfilled - Flag telling whether the properties are fulfilled to compute the route or not. Following code snippet shows how to use computeRoute method to find the route between source, which is the current user location identified by variable 'location' and destination, which is a POI identified by variable 'poi'. Now the OYMRoute object should be used to retrieve the projected position and the next instruction for the user. The localization support currently includes the instruction strings in English, French and Catalan. It is done through the OYMInstructionAdapter class which converts an Instruction object into a human-readable string and icon. It is a good practice to check the arePropsFulfilled flag before using any route object for navigation. This indicates if all the properties were fulfilled to compute a route. If the flag is false, it is advised to recompute the route. Similarly, when the user location returned by getProjectionForLocation method is far from the edge, it populates a field isRecomputeRequired to indicate that the user should recompute its route. This field should be checked before using the projected point for navigation. Please note that the notifications generated by SDK are not push notifications on the phone. Whenever a notification is generated, onNotification of OYMLocationDelegate protocol is invoked. This method can be then used in different ways to handle notifications. The notifications can also be filtered further based on its properties or according to the user profile. Trigger an action on receiving a particular notification: The following code shows how to display a message to a user on a 'NEARBY' notification. In this particular case, the application will show a Thank you message when the user is near an exit gate and is about to leave the place. Filter notifications based on user profiles: Notifications can also be sent to users based on their profiles. For this, add target to the notifications based on user properties. Update the user profile on the server. See the related sample here. The SDK will then automatically trigger notifications based on the profile. For example, if a notification is to be sent to adults above 21 years of age only, then update the user's age on the server through the application and while creating a notification on Admin Panel, add age property as a filter to it. The SDK will now send that notification only to users which fulfill the age criterion. A point of interest or POI is a specific zone that someone may find useful or interesting. 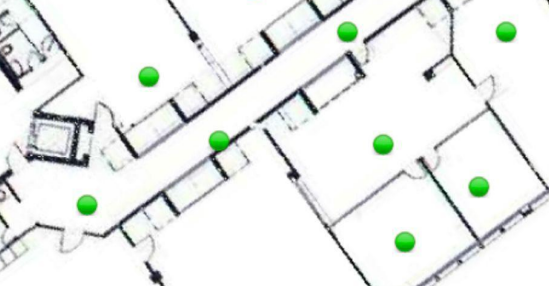 For example, various POIs in a location like hotel would be restaurants, parking spaces, reception area, gym etc. 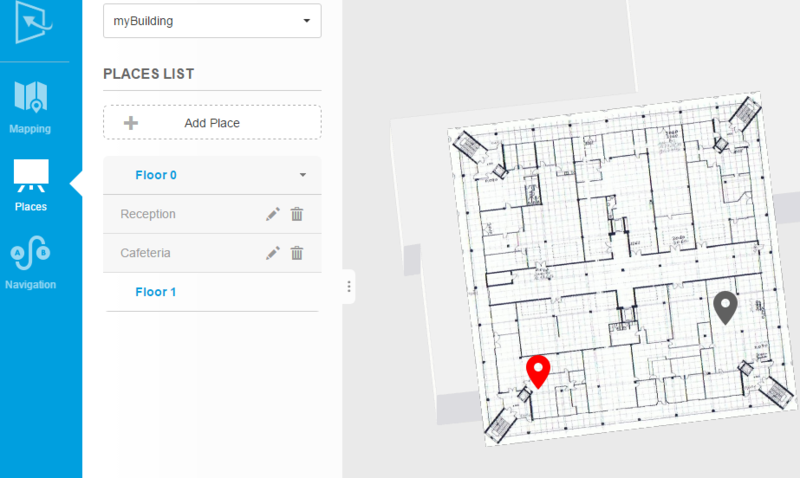 GoIndoor library defines a OYMPlace object which contains all the information about a POI like building id, floor number, latitude, longitude, geometry, properties and tags. OYMGoIndoor class exposes various methods to fetch places.For more details, refer this. Consider the following example where 'getPlacesWithLocationResult:andRadius:andTags:andFilter:' method is used to fetch the closest place in the location. Assuming the current location of the user is 'location', specify the radius from the location as zero and tags and filters as null as there is no specific search criteria in this case. Properties: Properties are used to save additional information about the points of interest. For example, for a place like reception, add a property 'timings' and save the receptionist's availability times as its value. This information can then be used in any way in the application. Tracking can be done by logging the location of the user on the server frequently. This can be done using various log methods of the OYMLogger class. Every time there is a change in location, onLocation method of the OYMLocationDelegate is invoked with the new location attributes. Once the new location is received, use logPosition method to simply log current location to the server at a certain frequency. This method sends user's location details to the server in the form of OYMLocationResult object. Following code sample shows how to update a user property on the server. Assuming that in the Admin Panel settings, there is a user property called age of type number and user age is defined by variable age, this code snippet updates user profile with the age field. This method putStatsPropKey can be used to update any user property to the server. Another use case of maintaining user profiles is to compute multimodal routes. In this case, user specific values of the properties of the edges are to be updated on the server so as to compute appropriate navigational paths. This value can be updated by using '– putNavPropKey:andUserValue:' method. This method updates the value of an existing navigation property for the user by providing its key (a.k.a. the exact name as defined in the Admin Panel) and the new value encoded inside a UserValue object. Currently, it can only supports a BOOLEAN as value. The GoIndoor library maintains the list of the buildings available for your account. Each Building object in turn includes all the floors available for that building and every floor has information about the tile provider. In order to show an indoor map overlap in MapKit framework, our SDK has a helper class OYMTileOverlay that inherits from MKTileOverlay. This object can be retrieved from the OYMFloor class and can be used to overlay it on a MKMapView instance. GoIndoor can also be used with Google Maps for iOS. In this case, first of all add the Google Maps for iOS frameworks. Find more information on this here. In order to ensure compatibility, it is required to include the OYMFloor+GoogleMaps category available in our repository. This category provides a tileProviderGoogle variable of type GMSURLTileLayer to be integrated in the GMSMapView. Assuming the map variable has been correctly initialized, to overlay indoor tiles in Google Maps, use the following code snippet for reference. A REST resource is an abstraction of a piece of information such as a single data record, a collection of records, or a query accessed using standard HTTP methods (GET, PUT, POST and DELETE). 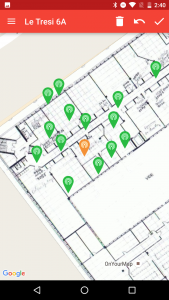 GoIndoor resources include information about Buildings, Floors, Beacons, Proxibeacons, Assets , Places, Userprofiles, ConnectedUsers, Notifications, Settings, Edges and Indicators. All APIs can be accessed over HTTPS via "https://www.goindoor.co/ws/v2/sql" domain. The response format is JSON. The REST API identifies GoIndoor users using account and password in the request header. Detailed description of various APIs can be found here.